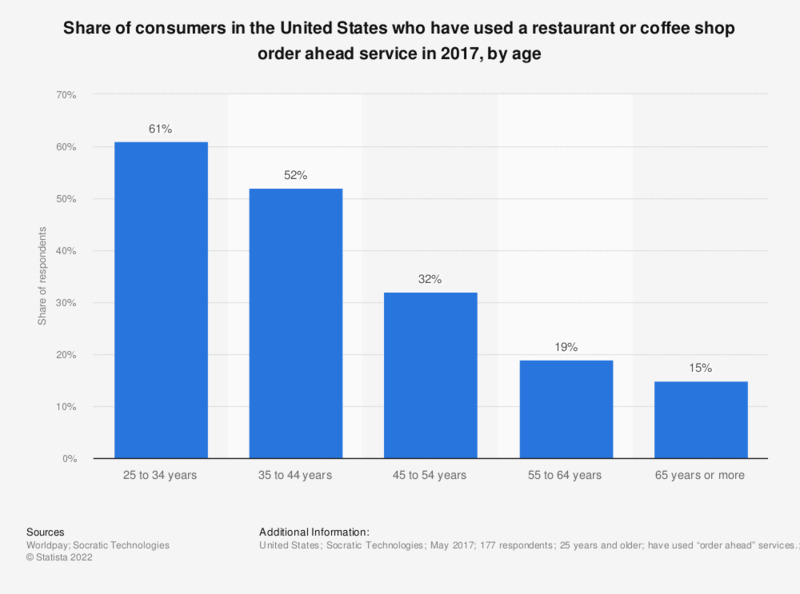 This statistic presents the share of consumers in the United States who have used a restaurant order ahead service in 2017, by age. According to the May 2017 survey, 61 percent of consumers aged 25 to 34 years, had used a order ahead service at a restaurant of coffee shop. have used “order ahead” services. This question was phrased by the source as follows: "Some restaurants, including quick service and coffee shops, allow you to 'order ahead' using a mobile app or their website. Then, your order is ready and waiting for you when you arrive at the restaurant. How familiar are you with this 'order ahead' service?". Have you ever chosen to order from a restaurant specifically because they offered the order ahead option?